2 Bed/2 Bath with Lock-out Feature. Annual, floating use, gold season. Annual floating use, Gold season. 2 Bed, 2 Bath, Platinum Season, Annual Floating Use. 2019 Unreserved. 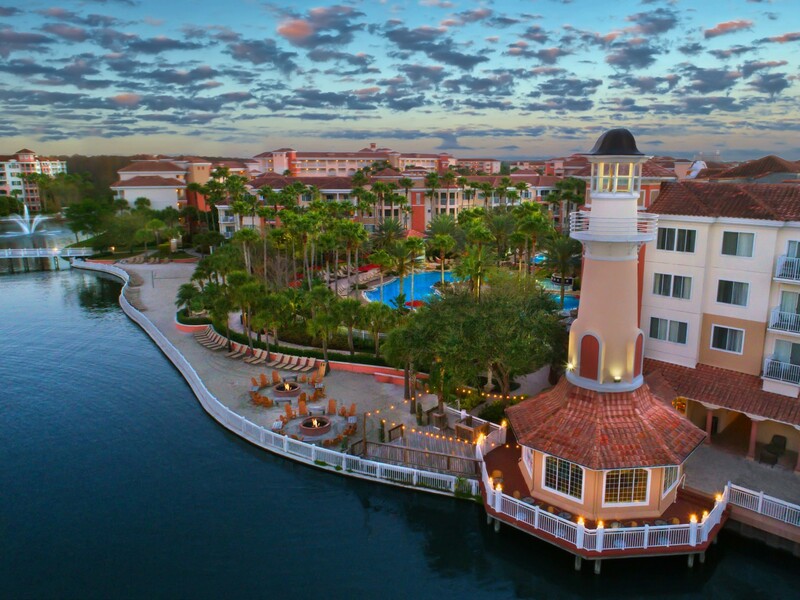 Located in the middle of Florida, Marriott's Grande Vista is the perfect place to buy a timeshare resale and spend a fun-filled vacation with your family. Marriott's Grande Vista is in such a great location in Florida, you can try something different every day and spend years and years before you run out of new things to do. Take your family on an adventerous vacation they will never forget at Marriott's Grande Vista timeshares in Orlando. If you want to relax with your friends and play some golf, you may want to check out the Faldo Golf Institute by Marriott. This prestige golfing institute offers a nine hole course that challenges you to use every club in your bag, a 35 acre practice range, a putting green, a special Video Analysis Swing Studio, an instructional staff to help you and a golf shop. Maybe you would just like to catch some sun poolside. Marriott's Grande Vista timeshare resales can oblige you there, with five swimming pools including a lap pool and two children’s pools. If you want to work up a sweat before taking a dip, you can visit the 24 hour fitness center complete with steam rooms and saunas. Or perhaps you’ll want to enjoy a game of tennis or basketball on the outdoor lighted courts. There are also family oriented activities for you. You can play some table tennis, spray one another with water rockets, make some arts and crafts, enjoy a beach campfire, rent a boat, and many more. You are also within minutes and walking distance of both Disney World and Sea World, a plethora of fun at your feet. You can buy a Marriott's Grande Vista timeshare resale in 1-, 2-, and 3-bedroom villa options ranging from 884-1,710 square feet, accommodating from four to 12 people. Each villa offers a fully equipped kitchen with a dishwasher, oven, microwave, full-sized refrigerator, cookware, and dinnerware. All you need to bring is the food and the rest is already there. The master suites are equipped with a king bed, a sitting area, and a whirlpool tub. Each guest room is equipped with a refrigerator, sofa bed, cable TV with a remote, and a DVD player. Marriott's Grande Vista offers a vast array of amenities for you. Personal amenities found in your villa include a washer and dryer, high speed internet access, free parking, an alarm clock, coffee maker, iron and ironing board, hairdryer, free newspaper, handicapped accessibility, an in-room safe, maid service, and a beautiful view of the lake or wonderfully sculpted golf course from your private balcony or patio. The villas are non-smoking. When its time to eat and you're not in the mood to do the cooking, you don't even have to leave the comforts of your Marriott’s Grande Vista fractional ownership. You have a number of restaurants to choose from right on site. If you want a taste of the exotic, try Roy Yamaguchi's Hawaiian Fusion Cuisine and Aloha Spirits for famed Hawaiian cuisine. They take a combination of local ingredients, European sauces, and Asian spices to create their own unique flavored entrees. If you like exotic seafood, try some Ono, Opakapaka, or Onaga. Also on the menu, you’ll find hand cut meats, sushi, and shellfish. If you are in the mood for an exciting atmosphere, try the Samba Room for Latin cuisine, grilled meats, fresh fish, and sushi options wonderfully blended with fruits and spices. For the less adventurous diners, make yourself at home with some American favorites found at Nick's Grill. Nick’s is located at the Faldo Golf Institute clubhouse. Perhaps you have an itch for a more Caribbean flavor, go to Bahama Breeze and enjoy some seafood, chicken, and steak all flavored and inspired with a Caribbean flair. Don’t forget to try a famous Bahamarita! In Orlando, Florida the sun is always shining, the breeze is always cool and the service is always wonderful. Whether you are catching rays by the pool or enjoying Space Mountain at Walt Disney World, everyday is another adventure to be had! Take a look at our Marriott’s Grande Vista timeshares for sale. You might just find the timeshare you want to buy is available at the price you want to pay! If you’ve had your fun with your timeshare and are considering selling a Marriott’s Grande Vista, the timeshare resale brokers at Premier Timeshare Resale can help you sell your Grande Vista Timeshare with no upfront fees.